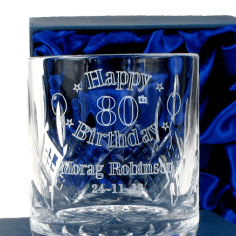 Engraved 80th Birthday Whisky Glass. 24% Lead Crystal has a good weight at around 310 grams and this Engraved Whisky Glass stands approx 8cm tall. Satin Lined Gift Box.